A major feat of American engineering has sprung forth alongside Highway 97 north of Bend with the completion of the $22 million Juniper Ridge Hydroelectric Project. coordination of engineers and contractors encasing over 2.5 miles of Central Oregon Irrigation District’s Pilot Butte Canal with primarily 9-foot steel pipe. Final testing is now underway to mark the culmination of work begun almost exactly a year ago in a ground-breaking project offering the dual benefits of water conservation and the production of renewable energy – to be sold to PacifiCorp. COID District Manager Steve Johnson spent several years marshalling resources, including assembling federal stimulus funds and tax credits, to realize a vision which involved replacing a 13,500-ft stretch of open irrigation canal with underground steel pipe and an innovative 3.5 megawatt turbine-driven hydropower system. By piping and conserving water supplies previously lost through seepage into the porous canal base, the Juniper Ridge Project will also benefit Deschutes River salmon and reintroduced steelhead. Experts anticipate the project saving around 20 cubic feet of water per second – or around 11 Olympic-sized swimming pools a day that would otherwise have been lost from the watershed. Johnson added: “A number of people should be commended for this project coming together, including the COID Board of Directors who shared the conviction and belief that we could make this happen. “Public entities often have a tendency to be risk-averse or conservative but in this case the board had a vision of the future and stuck with it. 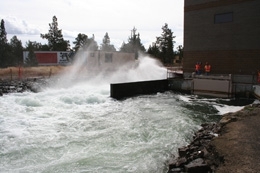 Johnson said the COID board was more receptive to the Juniper Ridge Hydro concept following the earlier success of the 5.5 megawatt Siphon power project built across from Bend’s Mt Bachelor Village in the late 80s. Demonstrable experience of the benefits and savings realized via that project – COID was recently also able to pay off associated debt to the state – led to a feasibility study of other sites within the canal system that could be candidates for potential power production. The Juniper Ridge site met the criteria for elevation change and flow rate, as well as addressing a goal of water conservation – the open canal stretch primarily running over leaky basalt rock. Johnson added: “There were a number of hurdles to negotiate, including navigating a mountain of regulations, state water law and land ownership issues, let alone the whole Request for Proposal (RFP) process for an Engineer Procure and Construct (EPC) project such as this. The EPC process initiated in January 2009 led to the hiring of Slayden Construction Group – a Stayton-based company with a number of employees in Central Oregon, including its senior executive, and an exemplary track record involving large-scale public conservation and reclamation projects – followed by the rest of the design and engineering team. Once the design and permitting phase was complete, the team had a tight timeframe to complete physical installation during the irrigation off-season between October and April. Greg Huston, president of Slayden Construction Group, said: “One of the challenges was that the specialized generators manufactured in Ohio had lead times of over 12 months, so logistics had to be finely coordinated to make sure everything fit together. “Also, we had a short window when the canal was shut down to drill and blast through solid rock and install seven million dollars worth of piping. “Happily, this was a ‘made in America’ project with all of the materials produced in the U.S. and Northwest Pipe in Portland was literally running seven days a week to supply the pipe and would truck sections daily to the site for unloading into the ditch and full joint welding. “Jack Robinson & Sons was also a key partner and were simultaneously able to recycle pretty much all materials on site as the rock removed was crushed and re-used as fill and pipe bedding, to add to the conservation emphasis of this project. Huston has close ties to the Central Oregon area, having graduated from Bend High School in 1980 and worked his way up through the ranks to become top executive after originally starting with the construction company as a backhoe operator. Huston, who lives in the Bend area along with a number of other Slayden employees, said the experience has been not only a professional achievement, but “personally gratifying” to work on a project that saves water and enhances the fish population while providing clean, renewable energy. Other areas addressed in the project included a plant bypass canal channel, solar battery-powered water level sensors, regularly monitored ‘trash-racks’, fish screens and safety back-up blow-off valves. The state-of-the-art hydropower unit, embedded in 14 feet of concrete, will generate clean, renewable ‘carbon-free’ electricity sufficient to power several thousand homes annually. Irrigation district patrons will also benefit as the project will modernize district conveyance facilities and improve overall system efficiencies. The State of Oregon – including Department of Energy loan, state tax credits and a Department of Environmental Quality (DEQ) grant – along with several business and conservation groups, together with contributions from the City of Bend and COID, played an instrumental role in financing the project. During the project’s construction, COID provided landowners with a supplemental water supply to compensate for the shutdown of the irrigation canal. Ron Robinson, one of the owners of excavation specialists Jack Robinson & Sons which was involved as a key subcontractor, said: “This was an extremely well-run project with a lot of facets to be orchestrated, especially due to the tight timeframes and detailed equipment involved. “One of the challenges was to keep the road through there accessible to keep the pipe coming and keep everyone working behind us as we created the trench then doubled back to fill. We had to work come rain, snow or shine. “As a local company, we were glad to be involved and the fact that our base is so close to the project site was also an advantage.